Organic, herbal smoking blends hand-crafted in Ashland, Oregon. Hemp wick is a health conscious alternative to inhaling butane from lighters and chemicals from matches. Your own hemp wick comes with each blend. We use Mountain Rose Herbs, hand-picked from the highest quality harvests, in our herb blends. Mountain Rose Herbs are Certified Organic by OTCO, Non-GMO Project Verified, Fair Trade by Fair For Life, Earth Kosher Certified, & Salmon-Safe Certified. How to use – Use Loosey Lu’s herbal smoking blends in your favorite way: roll a Loosey herbal smoke, pack a pipe, drink as a tea! 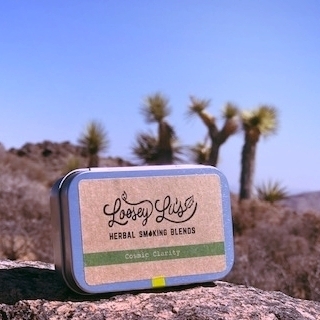 What for – Loosey Lu's herb blends are a beautifully mild way to experience the tastes and feels of the earth's natural medicines. Throughout time, smoking blends have been used in ceremony, for pleasure, and medicinally. Use your Loosey blend in place of or with your other favorite herbs. Thank You for your support while we take a moment to explore our curiosities and interests in Bali, Indonesia April and May 2019. We have chosen to simplify & at this time that looks like taking our blends offline and making them available only in our wholesale locations. I’m just the type to relax and let go, because as far as I’m concerned it’s just god’s big tripped out show // Herbs: Cloves. Coltsfoot. Lobelia. Marjoram. Mullein. Peppermint. Raspberry. When ye have too many things to feel but just one heart to push dem through, you mix it down with a smokey brew // Herbs: Damiana. Sage. Blue lotus. Motherwort. Lobelia. Raspberry. Peppermint. Herbs: Spearmint. Sage. Marshmallow. Rose. Lemongrass. Mullein. A rose by any other name would smell as sweet // Herbs: Rose. Damiana. Raspberry. Marshmallow. Lobelia. Mugwort. Skullcap. Sage. Mullein.